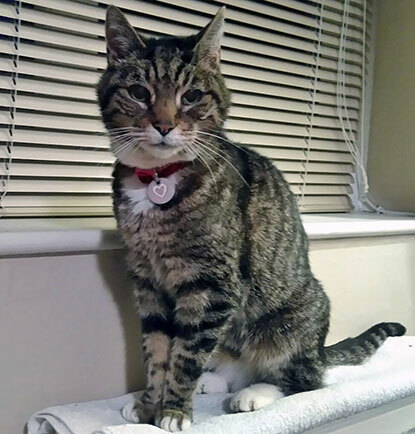 We've been sent this lovely update about elderly cat Barney who was adopted from us last year at the ripe old age of 20. “In Praise of Older Cats! Barney is still going strong at 21 and generally fit and healthy for his age! I have had him for just over a year now. My friends all thought I was mad taking on an older cat but there are many advantages to getting a more mature moggy! I wanted to take on a cat that no-one else wanted. As soon as I saw his photos I was smitten and went to meet him. When I'm at work he snoozes in a warm spot quite happily but still gets out of bed to greet me on my return. He is quite capable of jumping up on to a 5ft fence, as he has proved to himself recently, but he prefers to stay in the safer vicinity of his own garden most of the time. If he does go further afield he is still super-fast, as cats are, and can give the dog next door a run for his money! He prefers to stay indoors if it's wet so I don't get muddy paw prints all across my clean floor. He greets all visitors with a warm welcome and has to explore every lap in the room to find the warmest quietest one. He hates it when I'm on my computer but is pretty good at hitting the ‘Send’ key and has been known to appear on Skype. Great job CP and thank you! Veterinary note: Cats are generally considered geriatric from around 12 years of age and there are lots of simple steps you can take to ensure the later years of your cat’s life are comfortable and happy. Caring for an older cat in their twilight years brings a tremendous joy and many owners actively decide to adopt an older cat because of the endearing qualities they can offer. With their wandering days behind them, older cats tend to stay closer to home and appreciate gentle affection. Owners often comment on the special relationship they have with their older pet, enhanced by some simple measures and an understanding of their needs. For more information on caring for an older cat, please read our Essential Guide: Elderly cats leaflet. Gorgeous Barney! He doesn't look 21. I hope he got lots of lovely treats for his birthday. I adopted Smurfs (previously Murphy) and her brother Beamish last year, aged 17 (them, not me - I am WELL past that!). Tragically I lost Beamish to a brain tumour, but Smurfs is still going strong, and is a constant delight. Smooches to Barney - long may he find the cosiest lap & sunniest spot to sleep in. We adopted Trio when she was 12. Her previous owners emigrated to Australia. She was very wary @ first but gradually found her place in our home (under the table in the dining area, where she could ambush the other 2 cats!). She would 'sing' 'The Wheels on the Bus' with us, providing a crackly 'meow' on the last word of every line! We had 6 years of her loving and unique companionship until we lost her to a stroke. Such a privilege to have been able to give her a comfortable and very loved old age.